Since February 19th, the Faroese national team has bin in a training camp in Fort Lauderdale in Florida, USA. They will return to the Faroes on March 2nd. During this training camp, they were scheduled to play 3 training matches. The first match was against Lynn University, which the Faroe Islands won 3-1. The goal scorers for the Faroe Islands were Rasmus Nolsøe, Rógvi Jacobsen and Hanus Thorleifson. The second game was supposed to be against a team from Honduras, who last year won the South American cup-winners cup, but at the last moment, they cancelled the match. Instead, the Faroes played against at team from Chile's second division. They didn't put up much resistant and the Faroe Islands won an easy 7-0 victory, after leading 1-0 at half time. The goal scorers for the Faroes were Andrew av Fløtum 2, Jonhard Fredriksberg, Fróði Benjaminsen, Hans Pauli Samuelsen, Heðin á Lakjuni and Hjalgrim Elttør . Today, February 28, the Faroe Islands played against Real Salt Lake from the Major Soccer League. The match ended in a 1-1 draw. The Faroes started brightly and had a shot at goal in the first minute, but the ball went just wide of goal. Just 12 minutes into the game, Real Salt Lake went ahead thanks to a Ballouchy goal. 32 minutes into the first half, Andy Williams almost made it 2-0, but the Faroese goalkeeper made a diving save. 4 minutes before half time, Salt Lake's Jamaican playmaker Williams was shown the red card for a hard tackle. Both teams played aggressive and physical soccer and in the 86. minute, the Faroe Islands finally found an equalizer, when Andrew av Fløtum picked up the ball 5 meters from goal, after some ping pong in the box, and shot it into the goal. Ukraine won't accept the match-plan drawn up by the other countries in Group B, France, Italy, Scotland, Lithuania, Georgia and the Faroe Islands and who had all agreed to the schedule. The Ukrainians said they were especially unhappy with France ending the campaign with 4 home matches. And because the rules clearly state, that if all teams can't come to an agreement, UEFA will have to make a draw for a match schedule, then that is what is going to happen. The draw will be made on March 2nd and will be made completely randomly – no one will be seeded or get any other favours. The fixtures list will be made randomly by a computer. Be sure to return to SoccerAndEquipment.com to see the fixture-list! 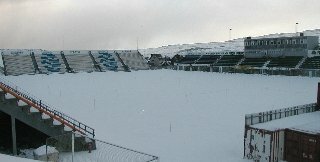 This is how Tórsvøllur Stadium in the Faroe Islands looks like in March 2006: covered in snow! And the winter in Ukraine is both long and cold, so that could create all sorts of problems also. Scotland had hoped to avoid playing in the opening round of games on 2 September, because Hampden Park has been contracted to a Robbie Williams sell-out concert. But with a random draw, Scotland will now have to play on that date, if the computer-draw tells them so. UEFA has given the 7 countries in EURO 08 Group B one more week to find a solution to their disagreements over the fixture-schedule. Originally, all of the countries, except Ukraine, had agreed on a fixture schedule, but the UEFA rules state, that if only one country disagree on the schedule, then the fixturs-schedule will be determined by a random draw. That draw was supposed to be made today, March 2nd, but UEFA has now extended a possible draw to Thursday on March 9th at 1pm, to give the countries one final chance to resolve matters. Since 1995, there have been 2 play off matches between no. 9 in the Formula division (best division) and no. 2 in the 1st division (second best division) for the right to play in the top flight, but this has now been changed, so that no. 9 in the Formula division will be directly relegated and no. 2 in the 1st division will be directly promoted. But surely, this can only mean that the level of the Formula division has been degraded, because since the play off-system was introduced in 1995, only 2 clubs from the lower division have managed to win against the club from the higher division. That happened in 1997, when TB Tvøroyri beat FS Vágar and in 2001, when Skála were promoted after winning their battle against B71 Sandoy. That's only twice out of eleven and should be a clear indicator that no. 2 in the 1st division has nothing to do in the Formula division. - Unless they can justify their existence by winning the play offs. But now they have been given a free ride in the top flight. For example, in the last 3 seasons, the team from the Formula division has won 7-1, 5-2 and 8-1 (aggregate score) against the 1st division team. But in the future, there will always be a weaker team in the Formula division. In January's round-up we wrote about Gábor Tamási from Hungary who was on trial with ÍF Fuglafjørður. Well, he managed to impress the man with the pen and has signed a contract with ÍF. EB/Streymur also had a player on trial, Joseph Odogu from Nigera, but he did not impress the man with the authority to sign, so he has left EB/Streymur again. But EB/Streymur is still looking to strengthen their squad and will have 30 years old Rafal Kwieciñski from Poland on trial. GÍ Gøta has asked Hungarian goalkeeper Geza Turi to come on a trial. Turi has played on the highest level in Hungary. He is the second goalkeeper to come on trial at GÍ, as GÍ also had a Brit on trial earlier this year, but he was not what GÍ were looking for.